1. 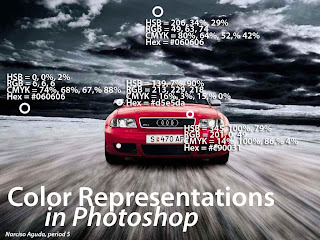 Understand the different modes that photoshop uses to define and describe colors by reading an online tutorial on Photoshop Colors and completing the 2 assignments. 3. Colors in a photo activity. 1. Have you ever lost someone? Who? When? Describe how you felt. If you've never lost someone, think of someone that is really important in your life and what that day would be like when you loose this person. 1. Download any photo from the internet. Make sure it is of high quality and resolution. You can go to google and choose LARGE or EXTRA LARGE pictures. -- CHOOSE one with MANY colors! 3. Create a new layer on the picture and call it, "SPOTS"
6. Save as JPEG, and/or PSD (If you feel you want to edit it later). 7. Email JPEG to me, then POST on blog.